1. Which is your favourite collectable minifigure inside series 5? 2. Will you like to see TLG releasing new LEGO Collectable Minifigures Series 6, 7, 8, etc? 3. How many complete LEGO Collectable Minifigures Series is in your collection? I am back again to conduct the latest poll and survey for the latest Collectable Minifigures Series 5 wave exclusively in our Eurobricks Community. With the official LEGO Collectable Minifigures Series 5 artwork being showcase in this discussion, I strongly believes this is the right time to start gathering our thoughts on our favourite LEGO Collectable Minifigures Series 5. If you wish to change your vote after you acquire the entire Series 5 after August/September 2011 or any point, you may choose to do so, as the current poll settings allow you to withdraw your votes by choosing other choices instead. Note: Descriptive names above are not confirmed and are subjected to changes at a later stage. 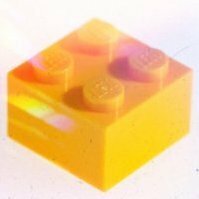 For the past official Eurobricks polls with regards to LEGO Collectables Minifigures Series 1, Series 2, Series 3 and Series 4, they can be found in the following links below. Tell us what you think about this upcoming new series! I, for one is glad that these LEGO Collectable Minifigures have reached to another brand new level. I am very pleased with this new series and seriously hope that it continues on. The fact that we are constantly getting new accessories to work with figures broadens the potential of the creation of more great customs. This is definitely not my favorite series overall, although the minifigs are still well done. For me, it was between the Grenadier Guard and the Eskimo, and I went with the Guard because he'll have a higher MOCing value for me. I definitely want to see more series from TLG; all the new parts we're getting are very useful. Fangy, could you add an option for 'I have 0 Complete Series'? I pick and choose the ones I want from each series, so I can't vote any of the current options, but the board says I have to answer all the questions. I am seriously in a dilemma with choosing the Grenadier Guard, Cavewoman, Gladiator or the Dwarf Warrior. It is such a hard decision. Yes. I have added that option. I voted for the Gladiator, I'm a fan of historical minifigs and it looks like a really good minifig with detailed prints and helmet. And the gladius short-sword is a really nice new piece. Runner ups for me was the British Guard, the army builder of this series, and the Egyptian Queen/Cleopatra, another great historical minifig that will fit great with the S2 Pharaoh. My least favourite is the Dwarf, too similar to the Fantasy Era dwarves, and the Mafia guy, only the violin case is interesting to me (and I would much rather have a violin! ). Overall this series is really good. I like most of the minifigs but there aren't many that I want multiples of (which is good for my wallet). I would rank this series third overall(from first to last: S4, S2, S5, S1, S3). 4 complete series for me, and I plan to continue to collect these minifigs. I think they are the best idea TLG has produced during this decade. Edit: WF, my vote changed when you put in the "0 complete series"-option. I fixed my vote but I think AoNZ's changed too, from 2 to 1. Really, did we need that question? I voted Zoo Keeper, because of the monkey. Because it's a new monkey. After much complementation, I will go and vote for the Gladiator instead. This is a pretty good series and there is a couple of them which I will like to have multiples too. i really like the Grenadier Guard! can do Buckingham Palace MOC? IMHO best one is graduate and worst one gladiator. I choose him because of one of the best headgears ever, awesome printed tile and torso, cool face and minifig wear. Rome. IMHO, helmet is abd designed, sword is ok, but with helmet he looks like he's wearing glasses. Royal guard is also cool, he simply looks great. They're also releasing figures that have been made into official sets too, for example the Viking and the Dwarf. A few, like the Series Three Chief and the Series One Ninja were in older sets, and they're welcome. However, the Viking was available for purchase from 2005-2007, and the Dwarf was available from 2008-2009. That being said, the series has produced a few amazing figures that most likely would never have surfaced (The S1 Wrestler, S1 Zombie, the S2 Spartan, and the S4 Haz-Mat Guy), but I believe that it's run its course. It's very difficult to make these figures, I know, but when a part of the Series is from earlier collections, and another part is from recent sets, I think they've exhausted their idea pool. When I heard the rumor that Series Five was the last, I was a little disappointed, but then I quickly rationalized it with the above points. I'm sure that future series will produce at least some rare figures, but the common ones from past series will keep popping in. I haven't voted in the poll, since I can't choose a favorite, but I'd like to be able to answer the other questions (how many series have I fully collected, etc.). WhiteFang, would you be willing to change the poll again to allow certain questions left blank? But a) not everyone was able to get all those other sets (I have just one Vikings set, for example, and none of the "fantasy era" Castle sets that have dwarves, even though I wanted to get several), and b) variety is always good and useful, certainly for figures not in some sort of uniform. I was glad to get the skater in Series 1, even if there are already plenty of blue skateboards; the skater's outfit is still new, and adds welcome variety to the range of torsos and faces available to builders. The Series 4 skater is even better, since he not only has a totally different outfit, but also a skateboard in new colors and with unique printing. I hope there are even more skaters and surfers and snowboarders produced in later waves - and additional cavepeople, zombies, Native Americans, etc., for that matter. I also don't think the figures you cite are actually the most common in the series. So Vikings and Dwarves are as unavailable as Ninjas (not anymore due to NinjaGo) and Indians. Why should it matter to TLG if AFOLs know how to find old minifigs (for high prices...) on the secondary market? 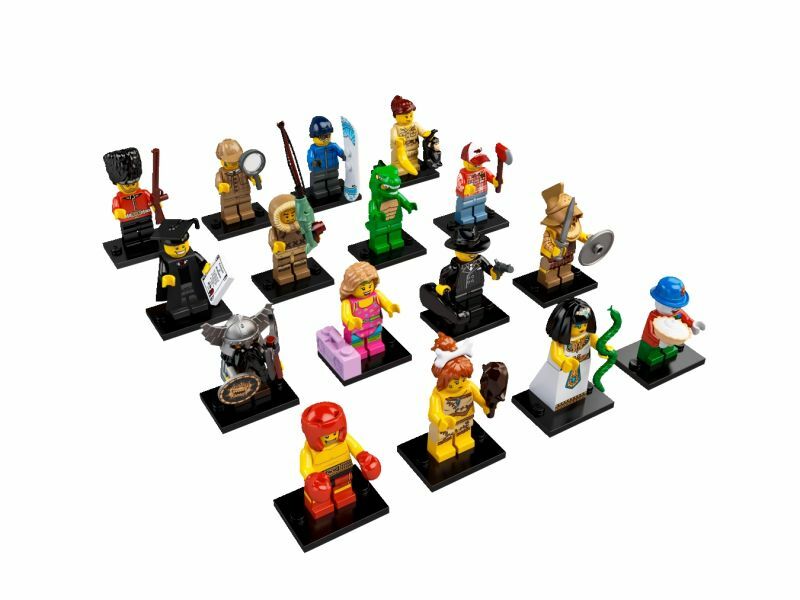 If officially there are no Vikings and Dwarves sets on sale, then making these minifigs available in CM makes sense. To be fair, it's actually quite difficult to pick on series 5. All of the figures are great but I would have to say that the Aerobics Instructor Cannot wait for these to be released. I voted for the Cavewoman because she has a brand new hairpiece in dark orange (a colour that i don't have a lot of), a nice face, and she's a nice companion to the S1 Caveman. The Small Clown and the Zookeeper were a close second and third, though. I love that new pie mould, and the Zookeeper's face, monkey and outfit are great. I would be very disappointed if these ended at 5. CM's are such an excellent source of brilliant parts and prints, and, although they're expensive, they are fun to collect. Unfortunately, I have a total of 0 complete series . There's a few that I really wish I had got (zombie, surfer, magician, pharaoh), but others not so much (wrestler, explorer). I also just wish I'd gotten at least one full series, just for the feeling of completion. There's still a chance to get Series 4 and 5, though! This is repeated from another thread, but the latest Brick Journal magazine interviewed some of the people working on CMFs who, back in the December time frame, when the article was apparently being written, were already mentioning they were working on 6, 7, and 8, and talking about how they are working on them while 3 was just hitting the stores, so I think they'll be going for quite some time. Look on the trading thread... PM people with other offers if you don't have figures to trade. Some people (myself included) are up for trading for non-CMF LEGO, too. This is repeated from another thread, but the latest Brick Journal magazine interviewed some of the people working on CMFs who, back in the December time frame, when the article was apparently being written, were already mentioning they were working on 6, 7, and 8, and talking about how they are working on them while 3 was just hitting the stores, so I think they'll be going for quite some time.. I know, I read that too. I'm just saying that if they had stopped at 5, that's how I'd feel. I've got a post there. That's how I got my beautiful cheerleader minifig! But I'm saying that I'd rather lose a couple of pounds than trade LEGO I already have. I chose the detective. As soon as I saw this series I knew I would have to get him. Luckily I've never felt the need to complete a series just to complete it. If there's a minifig I just don't care enough about, I won't go through the trouble of getting it. I came pretty close to completion with 3 and 4 just because they have so many ones I really like. Also luckily for my budget, there aren't a lot of series 5 that I feel the need to track down. I dont think this series is as good as series 4 - there is a feeling of repetition (Dance instructor, another snowboarder!) but to be fair my kids have both asked for these characters over many of the ones that the AFOL's favour. My son wasnt interested in the Spartan, and he's not interested in the Gladiator. My Daughter wants the dance instructor cos she's pink. We all want the Zoo keeper though. This is the perfect example of a CM which keps the line alive for me - I want her so I can build her a Vig (Maybe using Gorilla suit guy too) or a Safari vehicle - Just a lot of fun and a fantastic Monkey included. I just hope we get a male equivalent somewhere in the next few series, maybe with a baby croc. Sherlock Holmes - He's cool. Maybe the Dwarf warrior or the Lizard guy, possibly - other than that I'm not too excited this time around. Hoping for more space characters in series 6!!! Unfortunately, the poll settings cannot allow any missing questions. However, you can choose a near favourite and amend your poll options again once you have decided. I believe you have the option to withdraw and amend your vote. I voted for the Woodcutter/Lumberjack as I simply love the civilian nature of this fig, and the new axe piece, checkered shirt print and the cap. For me, S5 wasn't as good as S1, 2, or 4, but not as lackluster as 3. I like a good amount of the minifigs, but a few of them I'll pass on. I chose the gangster as my favorite, because of that neat pinstriped suit and that awesome violin tommy gun case. The gladiator was a close second, and I also like the Grenadier. I wonder which one will be the most sought-after for army-building? I will think that the Gladiator, Dwarf Warrior and Grenadier Guard. The secondary army building tier will be the Mafia Gangster, Graduate, Cavewoman and Pharaoh Queen. 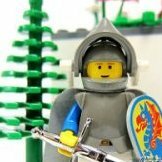 I am speaking from mine past experience and observation and from all of the past series, even some of the minifigures are not popular, but ends up being on the plates of the army builder. 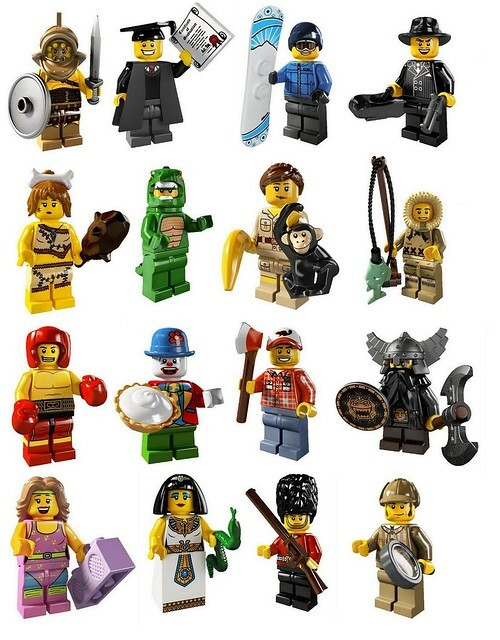 One of such minifigure was the Series 4, Vikings. There are a few figures that stand out to me, but I had to go with the Graduate because of all the great new parts he has (new torso, cap and gown, printed diploma). In my opinion, this series lacks the appeal of the figures as a whole that Series 4 had, but it's made up for by some really great new prints and molds, such as the Mobster's suit and the Clown's pie. Also, I saw that Whitefang selected the option of having all five series, does this mean that we'll get a review of Series 5 soon?